You won’t want to leave our quiet and comfortable Standard Rooms. Standard Rooms have all the amenities and modern comforts you might need whether you are staying over for work, leisure or romance. 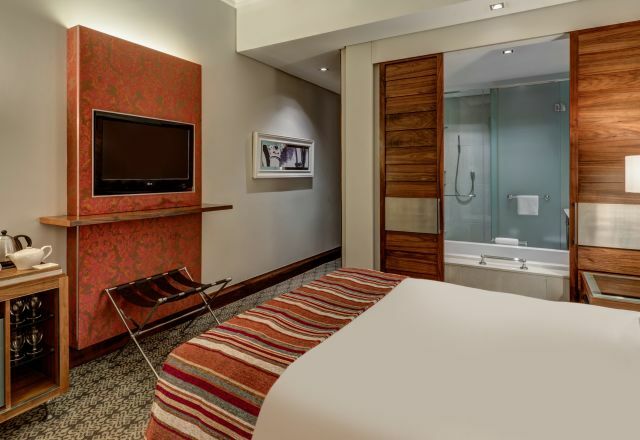 A comfortable Queen bed, classic Italian-inspired décor and furnishings, high speed WiFi, a flat-screen TV with great choice of DStv channels, a cosy corner chair for taking a moment and a convenient work space. Bathrooms with a bath and shower as well as full mirrors, exclusive Charlotte Rhys toiletries, styled in a mix of stone, wood and glass. Transform your room into a totally different space. Slide open double doors that hint at slatted window shutters from quaint Italian streets and let the bathroom become part of the bedroom. Order a glass of wine, run a bath and watch TV or enjoy the view from the comfort of the bathtub. You won’t want to leave our quiet and comfortable Standard Rooms.